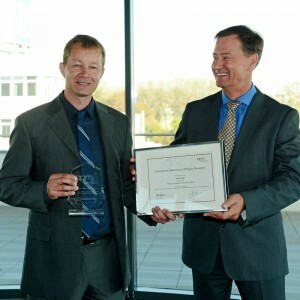 Laudation on Jörg Völler, " IAPM Project Manager of the Year 2012"
The IAPM has selected you as Project Manager of the Year on the basis of a comparison of the best Certified Senior Project Manager profiles over the last twelve months. The IAPM chose you for several reasons. Firstly, you gained a distinction in the comprehensive written examination for Certified Senior Project Manager (IAPM) certification. Furthermore, you achieved the highest score of all certification candidates in the assessment of your project management experience. The decision about who to present the award to is based, firstly, on the criteria of project management knowledge and experience. You demonstrated excellent competence in both areas. However, the IAPM also considers the third criterion of the project manager’s personal conduct in a project environment. At Kolbenschmidt, you have worked as project manager in various projects, including the Audi V6 and Audi V8 projects. According to your superiors and colleagues in the project, you have behaved in an exemplary way towards the customers and the executive management, your expert colleagues in the management team and your project team members in your role as project manager. Two of the people who provided a reference in this respect are Dr. Eduard Köhler and Dr. Christian Klimesch. The personal traits that people who know you appreciate above all are your down-to-earth nature, your communication skills and your approach to project management. In short, people in the project environment enjoy working with you. As a result of your personal interpretation of the project manager’s job, you have a strong identification with the projects that you are assigned to, which results in the success of the project for all involved. Whether your team has five or twenty members, you manage the project professionally, cater to the customer’s needs and requirements to its satisfaction and ensure that the project delivers the agreed result. You generally manage complex development projects, i.e. you are responsible for the implementation of projects with deliverables such as cast parts for vehicle cylinder housings. These responsibilities extend from the development of prototypes to the series manufacture stage, as well as adherence to deadlines and budgets. This is all the more remarkable due to the fact that most of the projects you manage are several years in duration and have substantial budgets. For all of the above reasons, the IAPM has decided that you have all the qualities of an ideal project manager and, for this reason, we are presenting the Project Manager of the Year award to you today at Kolbenschmidt on behalf of all project managers in the IAPM International Association of Project Managers. We hope that many other project managers will follow your example and we hope that you continue to enjoy the field of project management and are successful in all of your projects.